What can be said about the original "Halloween" that hasn't already been said? John Carpenter took a basic story line, about babysitters being stalked by a faceless madman and turned it into something truly terrifying. In this day and age, the movie is viewed as "boring" and "slow" and while this may be true to the regular person, to someone who has never seen the movie before is in for a real treat. The beauty of "Halloween" is in it's pacing. 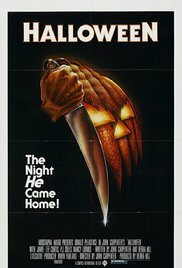 While today's horror movies are edited like music videos, due to the attention span of most people being reduced, "Halloween" takes it's time, setting everything up before finally getting to "the good part"
The opening scene of "Halloween" sets in motion how the rest of the movie is going to play out. By opening the movie with POV shot, John Carpenter is doing two things. The first is he is putting us into the role of the young Michael Myers. He is giving us nothing, but everything at the same time. The only thing that we know is what is put in front of us. The second thing is the reveal at the end of this scene. After Michael kills his sister he walks out the front door to be greeted by his parents. Only then do we find out that the person who did all of this is a child. As the camera, now out of the POV mode, pulls back the young Michael Myers just stands there with no emotion on his face. John Carpenter has just scared us more in five minutes then most of "Halloween"'s imitators have done in their whole movie. The rest of the movie is far from normal. We meet the babysitters who don't know what is in store for them on this fateful halloween night. This is where, for many people, the movie becomes boring. The thing Carpenter is doing here is giving us normal people. He is not giving us characters, but people with real emotions. Sure, they are not the best drawn people in the world, but they need to be. We feel like we know them so therefore we care. We also get to meet Myers' doctor, Dr. Loomis. Played by Donald Pleasance, Dr. Loomis is actually afraid of Myers and the only reason he chases Myers down after the escape is because he needs to stop Myers. By making Loomis scared of Myers, Carpenter has allowed a faulty hero. Here we are given a man who would rather have nothing with Myers, but feels responsible for Myers escaping. After Myers escapes Smith's Grove he returns to where he committed his first murder, obviously to continue where he left off. This may seem like a simple plot device, but it would only be natural for him to return home as it's the only place he knows. Something that many people don't realize is that "Halloween" is violent,but relatively blood-less. This is not a gore film by any means and Carpenter shows great restraint by keep gore out of the movie. This movie could have easily turned into a bloodbath, but Carpenter is smarter than that. He allows his camera to see the action, but never linger on it. Once a murder is committed we move. Michael Myers is described in the movie as "pure evil" and he lives up to this description, but not in the fashion that most would think. Myers toys with his victims, waiting for them in the shadows, watching their every move. He strikes when the fear has set in, but the fear doesn't come from the characters, it comes from us. Carpenter has worked us up into such a frenzy that when the typical jump scares come we don't know what to do. Another thing that Carpenter does is that he makes Myers a "faceless evil". In other slasher movies this is done to hide the fact that the killer being played by a stunt man, but here it is used to symbolize the fact that pure evil is faceless. The killer could be anybody. It is not until the end of the movie, during a struggle with Laurie Strode, that the mask is removed. It is at this point in the movie that the "pure evil" is given a face, the face of a normal looking young man. With "Halloween" John Carpenter showed that he could craft a movie that truly scared people. Up until 1990 it was the most successful independent movie ever. When all is said and done people will remember "Halloween" as one of the best horror movies ever made.